Welcome to new Hartland Chamber Member – F5 Funnel Cakes! The Hartland Chamber of Commerce welcomed a new member recently. 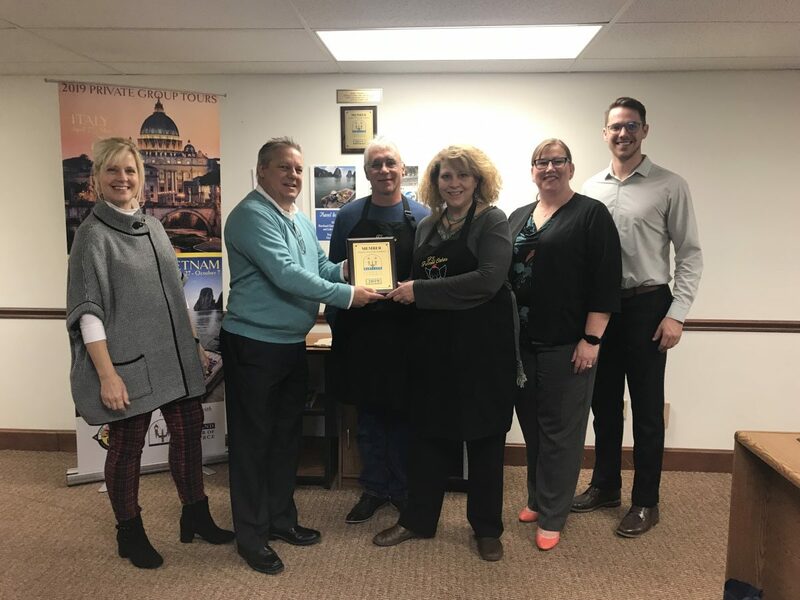 Ambassador Scott Heyerdahl of Scott Heyerdahl- First Weber, Premier Partners (left) presented Mary Kay Heidger and Ron Novak of F5 Funnel Cakes with a membership plaque from the Chamber. Also pictured are (l-r) Lynn Minturn, Hartland Chamber President and Chamber representatives Karla Lauersdorf, Ixonia Bank and Dr. Mike Merkt, The Specific Chiropractic Centers – Lake Country. F5 Funnel Cakes is a mobile concession trailer providing sweet confections to public and private events. They provide, of course, funnel cakes, and also elephant ears, deep fried Oreos, Twinkies and Snickers. At private venues they can tweak the menu to your preferences. Everything they serve is hot and fresh. For more information, contact F5 Funnel Cakes at f5funnelcakes@aol.com. THE HARTLAND CHAMBER WELCOMED KELLER WILLIAMS LAKE COUNTRY WITH A RIBBON CUTTING CEREMONY! MEET OUR HARTLAND CHAMBER BOARD CHAIRMAN/AMBASSADOR – MATT GAULKE!